Heat oven to 350°F. Line 9x5-inch loaf pan with foil; spray foil with cooking spray. In large bowl, mix bread and milk. Let stand 5 minutes to absorb milk. Add beef, all but 2 tablespoons of the bacon, the shredded cheese, relish, onion, garlic and egg. Mix until well combined. Shape mixture into 8x4-inch loaf. Place in pan. In small bowl, stir together Topping ingredients. Spread on top and sides of loaf. Top with reserved 2 tablespoons crumbled bacon. Bake uncovered 1 hour to 1 hour 15 minutes or until meat thermometer inserted in center of loaf reads 160°F. Cool 10 minutes. 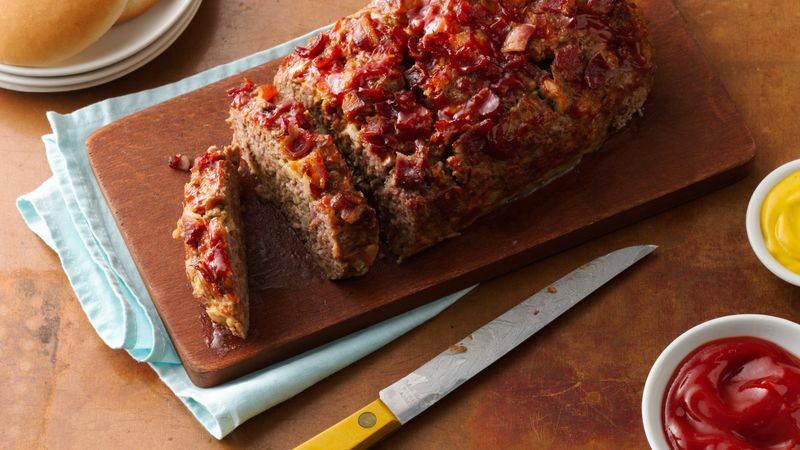 Cut meatloaf into slices to serve. Top with desired burger toppings, such as pickle relish, ketchup and mustard. Serve meatloaf on burger buns for a unique twist on bacon-Cheddar burgers. To make ahead, mix meatloaf ingredients, and shape as directed. Brush with topping, and cover with plastic wrap. Refrigerate up to 24 hours. Bake as directed, adding an additional 15 minutes as necessary.